Lamb makes a great burger. Lamb burgers can replace regular hamburgers at any barbecue. This is a simple lamb patty recipe, with a hint of fresh mint. Mint goes so well with lamb. Add red pepper flakes or your favorite hot sauce to your taste. In a large bowl mix together the lamb, onion, bread crumbs, egg, garlic, salt, pepper, mint and pepper flakes. Form into patties. Place burgers on a baking sheet and cook in preheated 375ºF (190ºC) oven for 20 minutes or until cooked through, flipping after 10 minutes. You can vary the heat level of the lamb patties by adding your favorite hot sauce if you like it hotter, or omit the red pepper flakes completely if you don’t like it hot at all. Serve on whole wheat buns with your favourite toppings, or for a low carb option, omit the bun and serve with lots of vegetables and salads. 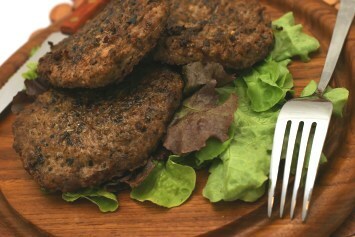 Lamb burgers are a wonderful diabetic diet option. However, as a diabetic recipe, I would leave out the bread and serve these great burgers with the vegegetables and salads. How about this for a wonderful Mediterranean themed meal: lamb burgers with Mediterranean marinated grilled vegetables, tabouli, and a refreshing cucumber salad. There are a lot of other wonderful vegetable recipes on the site that would go wonderfully with these lamb burgers. Use the search box above to find some great choices.